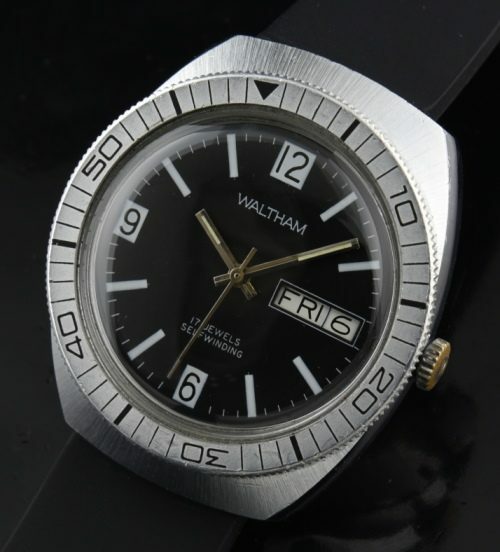 Home / Shop – Vintage Watches For Sale Used & Antique / Uncategorized / Waltham Dive watch 1970’s. This 37x43mm. WALTHAM dive watch from the 70’s has quite a wrist presence! The thick 14mm. case (including crystal) looks excellent. The automatic winding WALTHAM movement was just cleaned and is accurate. The turning bezel looks very good with only light marks. I love the easy to read dial with large Arabic rectangular encased numerals. The day/date feature is a bonus.